Gain new team skills, more confidence, and practical techniques to improve your effectiveness as a team leader. 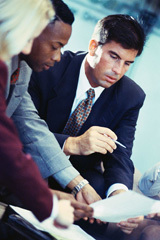 Enhance your skills in problem-solving, decision-making and meeting management. Apply new group dynamics and tools immediately. This workshop is geared for all levels of prospective, new, and experienced team leaders. It is also suitable as a general management workshop if you are a manager or supervisor in a team-based workplace.